We are in the midst of a revolution in computing, with "machine learning" algorithms solving problems for which major progress was thought to be decades away. As a result, computers can now exceed human performance at tasks such as recognizing patterns in images, playing complex games such as Go, and even driving cars. Can we harness the same machine learning algorithms to advance our understanding of physics? Understanding materials at the atomic level could lead to rapid advances in areas such as solar energy harvesting and the design of new computer hardware. The complex behavior of trillions of atoms all obeying the esoteric rules of quantum mechanics is not, however, easy for humans to untangle on their own. 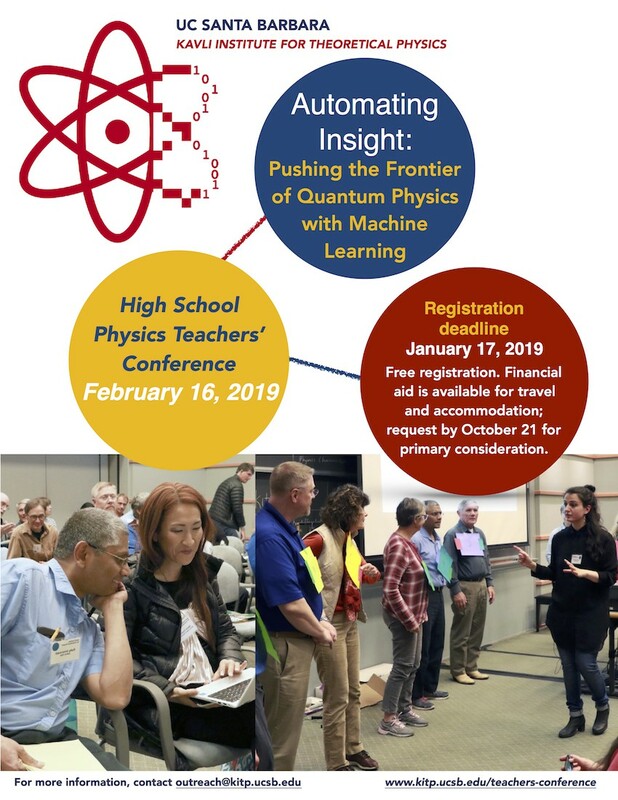 At this teachers' conference, we will hear from scientists using the techniques of artificial intelligence and machine learning to advance our understanding of the quantum behavior of such matter as magnets, metals and superconductors, as well as the constituents of atoms. We will also hear how insights from physics could be repurposed to advance the field of machine learning itself. What is a KITP Teachers' Conference?